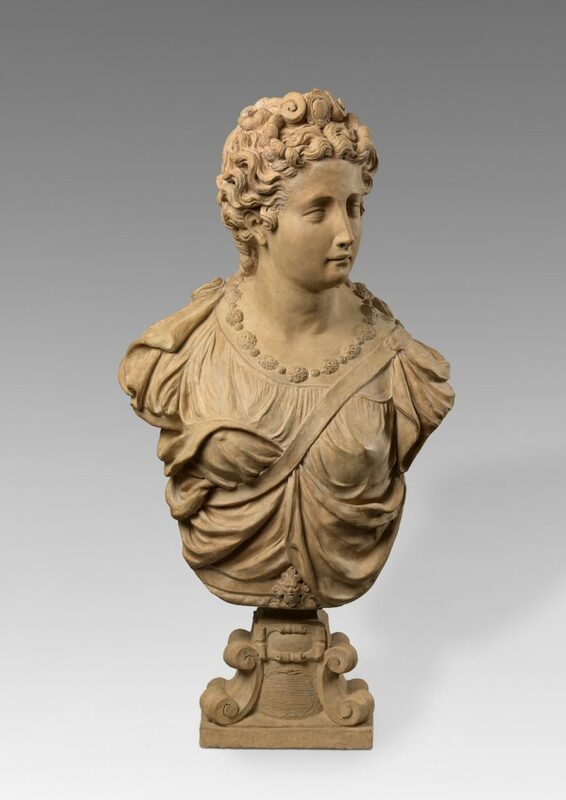 This fine pair of Renaissance busts, possibly depicting mythological or allegorical female figures, constitutes a valuable addition to the oeuvreof Prospero Clemente, also known as Prospero Spani or “Il Clemente”, who worked extensively in the region around Modena and Reggio Emilia astride the middle of the 16thCentury. The conclusive attribution has been proposed by Dr Andrea Bacchi on the bases of substantial and convincing comparison with documented works by the artist. A singular sculptor with a pronounced and idiosyncratic aesthetic, Clemente trained with his grandfather Bartolomeo before being apprenticed to Antonio Begarelli. The influence of Michelangelo soon became a lasting trait of his mannerist style, clearly discernible in sculptures such as the marble Adam andEveon the entrance portal of the Reggio Emilia Cathedral. His first documented commission, the Funeral Monument for the Blessed Bernardo degli Ubertiin the Cathedral of Parma, dated 1544, provides us with a valuable termine ante-quemfor much of his production. In 1552, Clemente obtained an important commission for four sculptures to adorn the façade of the Reggio Emilia Cathedral. For these, which included the above-mentioned Adamand Eve, the artist looks back at Michelangelo’s lesson as mediated by the Mannerists and, specifically, Bartolomeo Ammannati. Compare, for example, Clemente’s treatment of San Cristoforo’shair with Ammannati’s Cerere(Bargello, Florence). In a sculpture such as theSanta Daria (fig. 1), some of the traits that will come to distinguish his production are already evident: as well as the finely carved and undulated hair, notice the sharp and elongated eyebrow line, which also appears in the Virgin with Child, commissioned in 1558 (Reggio Emilia, Basilica di San Prospero, fig. 2). 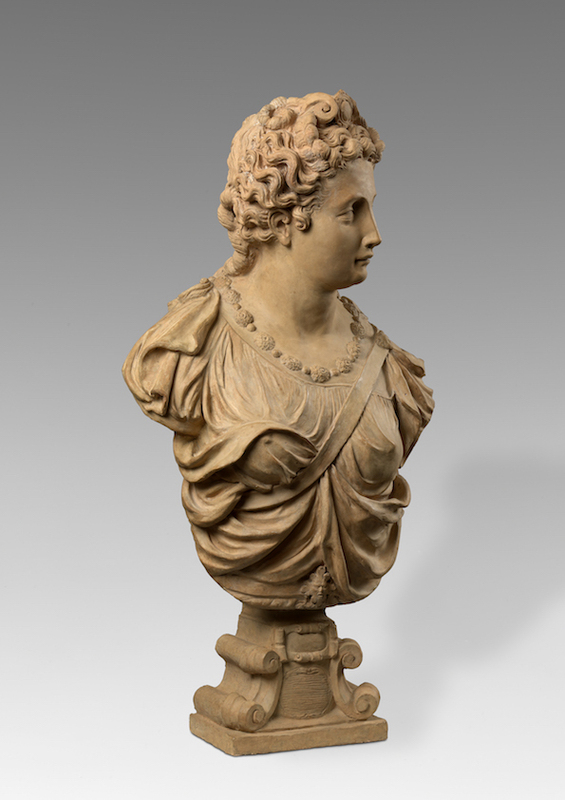 Signs of an already mature style that is fully capable of interpreting the Roman Manner, rather than tacitly following it, these reappear in all their distinctiveness on the present busts. By the mid-1550s, it would then appear, Clemente had found a language that read Roman Mannerism with an eye typical of the “area Padana”: the idealised faces are sweeter, the proportion of the bodies heavily draped are slightly slender, the traits more temperate than those of their Roman counterparts. Indeed, as aptly noted by Bacchi (op. cit., p. 58), a piece such as Clemente’s Virgin with Childfigures amongst “the most astonishing translations in marble of the physiognomic abstractions ideated by Parmigianino”. It is not just the modelling of hair and eyebrows, but also of the heavy folds of drapery alternated with playfully swathed fabric around the figures’ bosoms, that almost takes the appearance of a signature. Compare, for example, the one on the allegory of the Churchadorning the Funerary Monument to Antonio Bernardiin the Mirandola Collegiata, and that on the first of the present pair of busts (figs. 3 and 4). 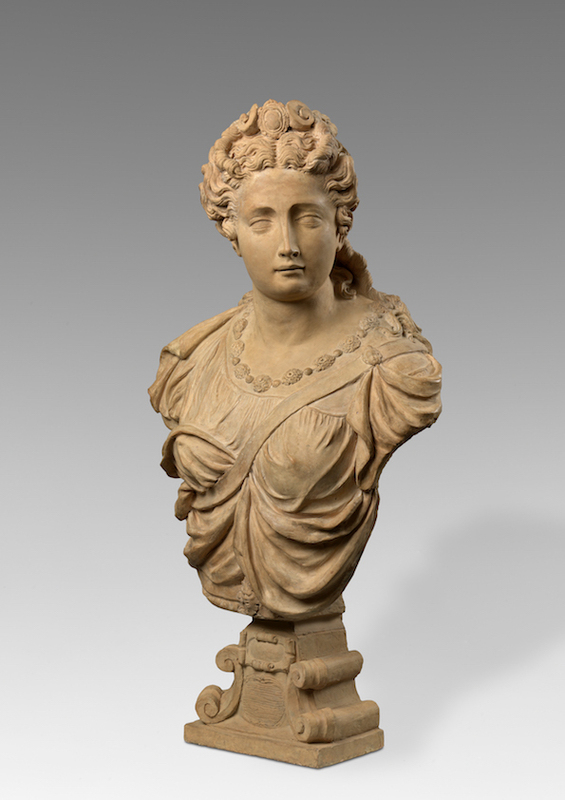 Aside from numerous commissions for churches, which included not only marble but also terracotta and bronze sculptures, Clemente worked extensively with secular subjects, for the most part linked to the buoyantly elegant court of Alfonso II d’Este, Duke of Ferrara (1533-1597), whose father Ercole II (1508-1559) had, in the 1550s, commissioned Clemente his Bust now in the Galleria Estense, Modena (fig. 5). Renaissance aristocratic entertainments, pageants and parades often involved the creation of ephemeral stages and sculpture. Thus, in 1560, on the occasion of Alfonso’s announced first visit to Reggio, Clemente was asked to create a stuccoed sculpture of the Roman patrician Marco Emilio Lepido (cf. Bacchi, op. cit., p. 85), which was destroyed in a matter of days. Soon after, the sculptor tried his hand at two further colossal statues, this time in marble: the Ercoleand another Lepido, both of which are now in the Palazzo Ducale, Modena. It is in this context that the present pair of certainly secular busts can be best understood. Indeed, these relate to a pair of marble busts of Dianaand Minerva(figs. 6 and 7) which are now in the Galleria Estense, Modena. The busts, highly decorative in their stylised drapery, remind one of the description left by playwright Gabriele Bombace of the set that had been created for his tragedy Alidoro, performed for Barbara of Austria – Alfonso’s wife – in 1568 (cf. idem, p. 99). 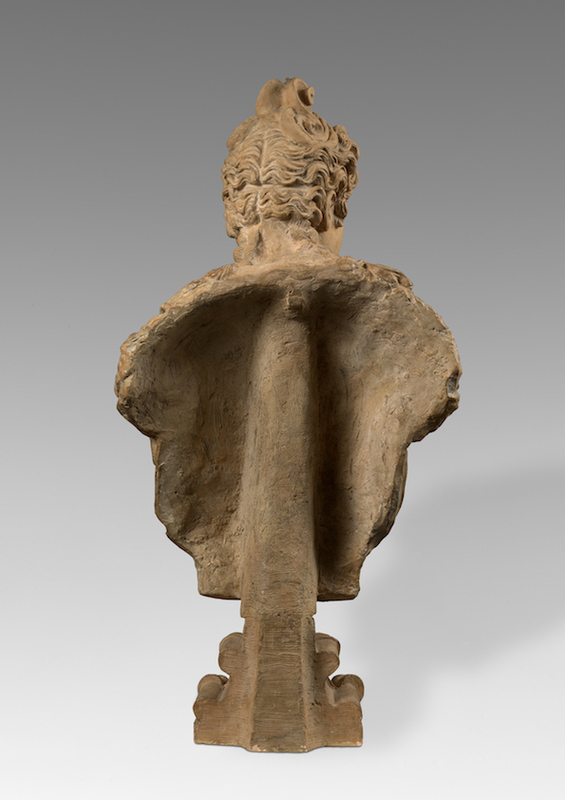 Clemente had contributed and had been paid for a number of busts, said to have been “Lunar marble” (“marmo di Luna”), depicting gods and goddesses as well as the virtues, which were all placed in niches around the stage. 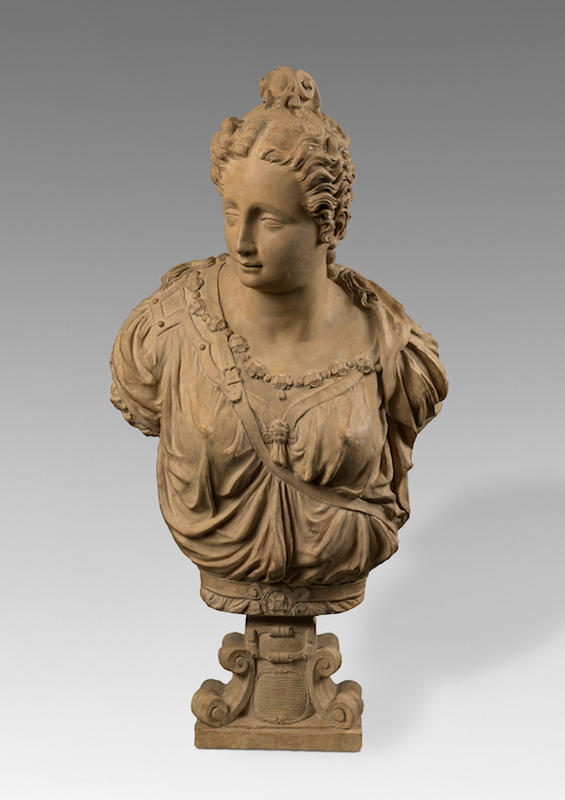 It would appear unlikely that such an apparently large quantities of sculptures could have been realised in marble, and it is perhaps legitimate to wonder whether some would not have been executed in terracotta. The present pair, whose stately apparatus would suggest an identification with goddesses rather than allegorical figures, was also certainly intended to stand within niches, and was certainly informed by Clemente’s extensive involvement with secular subjects, as well as stage decoration. Intriguingly, the busts’ overall outline, the truncated shoulders and rounded finishing of the lower torso, decorative elements and hairstyle find strong parallels in bronze medals of two artists contemporary to Clemente, Alfonso Ruspagiari and Gian Antonio Signoretti (fig. 8; cf. also Bacchi, op. cit., p. 101). 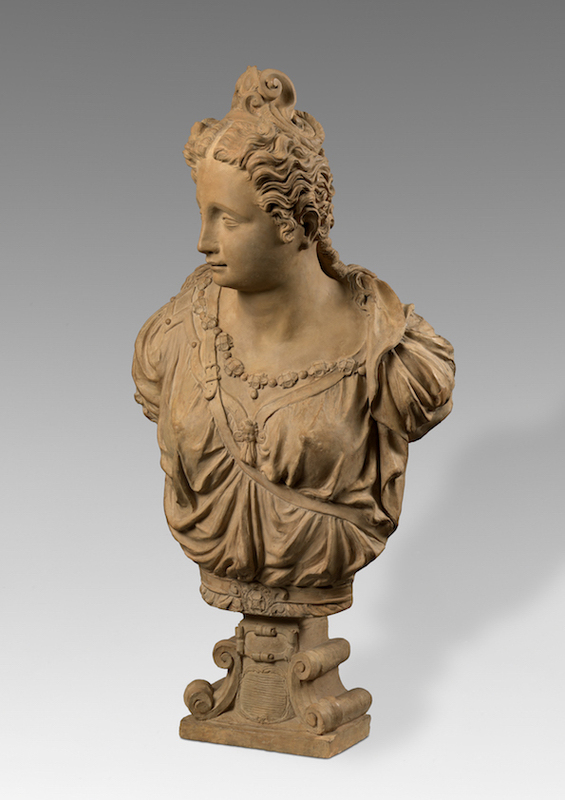 The present pair of female busts are therefore emblematic of Prospero Clemente’s production; moreover, they appear to be the only remaining terracottas by the artist. With their dignified countenance, vigorously modelled locks of hair, elegant line of the highbrows and elongated nose – the distinctive traits of Clemente’s aesthetic – they are also worthy of the graceful Mannerism then blossoming within the aristocratic courts of Central and Northern Italy.